REPL is licensed manufacturer and exporter of Ayurvedic and homoeopathic medicines. 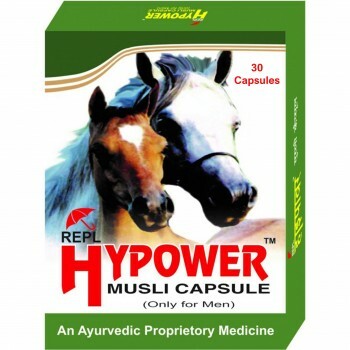 HYPOWER ™ Musli Capsule is sole registered brand of REPL. We are GMP, FSSAI, PCI DSS and ISO certified company. This can help you make sure the REPL is authentic and not selling unregulated product. Purchase the HYPOWER ™ Musli Capsule directly on our e commerce website of www. repldradvice. com or authorised seller to avoid counterfeits. If buying online on different websites other than us, check the authority certificate of seller issued by us to sell online. This can help you in getting original product. Learn how to buy original HYPOWER ™ Musli Capsule safely online. Make sure that when you buy HYPOWER ™ Musli Capsule online, you get real HYPOWER ™ Musli Capsule. Many of the sites that claim to sell HYPOWER ™ Musli Capsule online are actually selling potentially dangerous counterfeits. How to use HYPOWER ™ Musli Capsule? Do not use pickle, raw onion. HYPOWER ™ Musli Capsule is a Ayurvedic medicine, it may be used without prescription if indication matches. It is recommended to use the medicine on prescription.